Here is a birthday cake party dress. 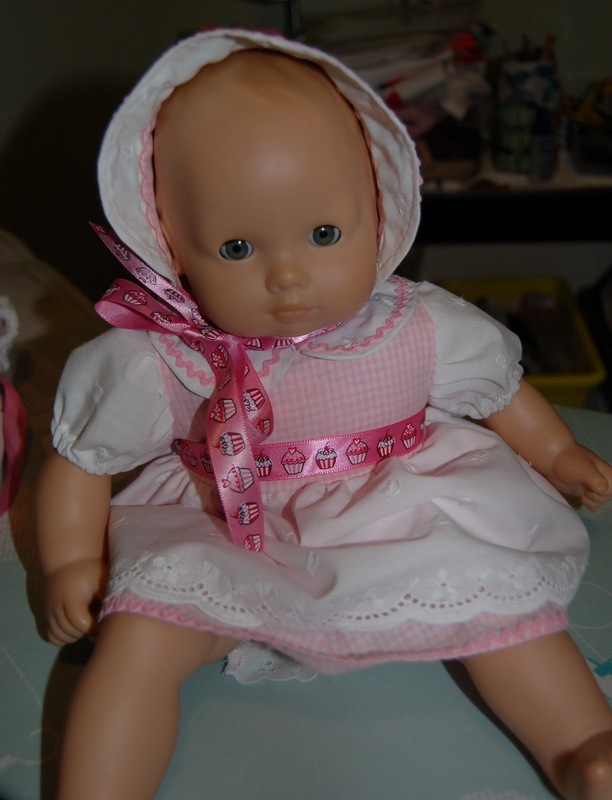 It includes a bonnet and undies that match. 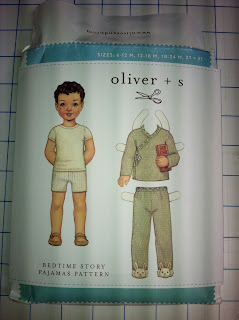 I used this pattern to make Hannah the PJs she is pictured in below. It's not the world's greatest pattern. It's a little tricky to follow. The entire doll outfit collection. I made two sets. One set for the North Carolina LLL Conference Silence Auction and one for the girls for Christmas. The first is an all satin princess gown with lots of fun, fancy stitching. The second is a dolphin beach outfit with a wrap around top and shorts. 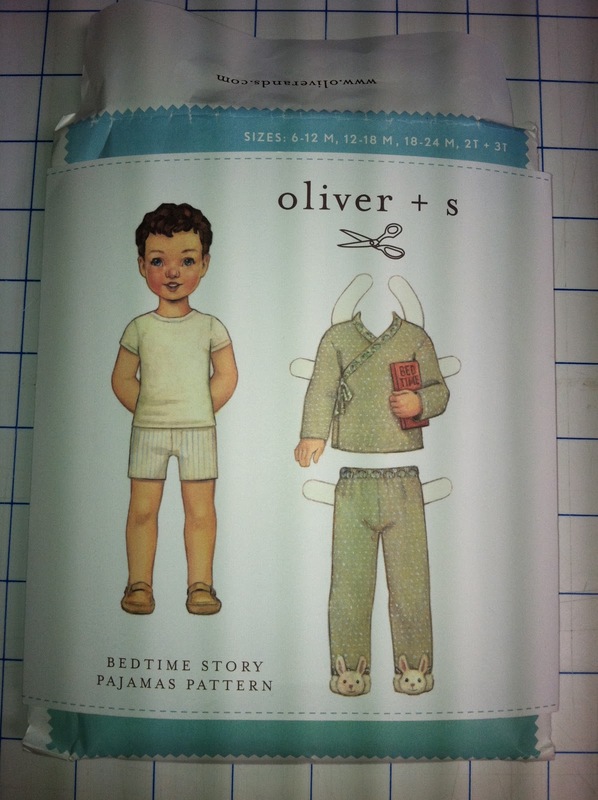 (It's a Cabbage Patch Kids pattern that my mom used to make clothes for my dolls!) There are two diapers. And then the cupcake party dress pictures above. They were fun but a ton of work! Doll clothing is pretty much the same as kids clothing but a million times smaller. I am done with itty bitty arms holes for a while. I hope they go for a lot at the auction and raise money for the LLL. I sure wish I could be there! I made this skirt for myself with the Amy Butler Barcelona Skirt Pattern. It's hard to see the layers in this picture because I have not washed it yet. But you can see them in the link. It was really fun and rather easy! I think I'll do the apron skirt next. I got these at a great clearance price at Target. They are kitchen towels. 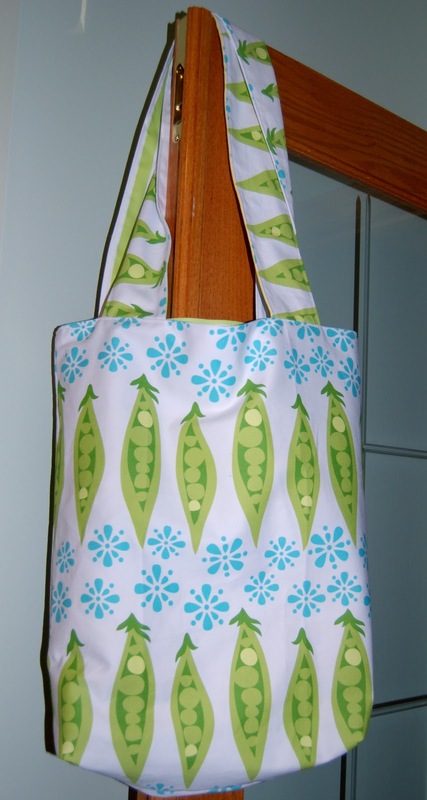 I made this reversible tote bag with them! I used this tote for Ella and Pete's wedding gift. I titled it "Oh Sweet Pea." 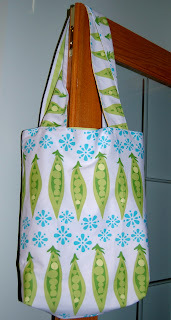 I also made a round cloth basket and towel with a sweet pea applique on it. They turned out super cute but I forgot to get a picture. Missy filled the basket with her wonderful Naked Beauty products. The inside of the tote bag. I think it turned out really well. It's a great size for the Farmer's Market. I have several of the towels left so perhaps I'll make my own bag. Ella and Pete's wedding quilt. 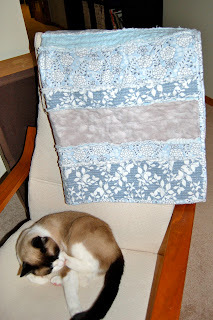 I had grand plans of doing a fancy bed sized quilt, but life got in the way of those plans. Instead I made this simple throw quilt. It's a rag quilt made of very soft flannel. I picked the colors because they reminded me of the beautiful blue skies we backpacked under in Montana, Wyoming, and Alaska. (Both Ella and Pete attended Widjiwagan with me.) Their wedding was absolutely beautiful. I could not imagine a better celebration of their love for each other. Everything was so personalized and very Ella and Pete -ish. I also got to see many old friends from camp. It was such a blessing to celebrate with Ella and Pete and catch up with dear friends! So those are my recent projects. Next up is a couple dressed for the girls. I purchased some really fun fabric at Jo Ann's the other day. I have Ella's dress half done. I'll finish them up tomorrow. I got a great deal on black t-shirts at Target today and I plan to do some fun Halloween applique on them. I am in Christmas mode as well! I've got the doll dressed for the girls done already. Their big gifts will be bean bag chairs and I can't wait to get started on those! Of course I have other special projects for friends and family as well, but I can't say what they are, because unlike my girl's they can read this blog!